The Stanley Cup Playoffs has its final four! 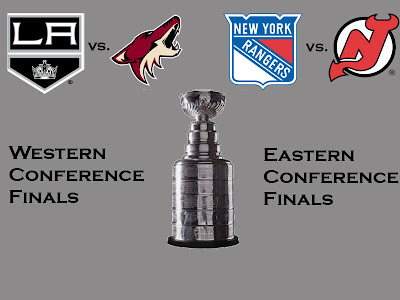 The Los Angeles Kings and the Phoenix Coyotes will battle it out for the rights to represent the Western Conference while the New York Rangers and New Jersey Devils will face off to represent the Eastern Conference in the final dance. The Kings made quick work of the St. Louis Blues eliminating them in just four games and the Coyotes finished off the Nashville Predators in five games. The Eastern Conference took a little longer to settle who would advance. The Devils advanced after defeating the Philadelphia Flyers in five games. While the Rangers went to a decisive games seven with the Washington Capitals before advancing. Nonetheless the final four has been set and here is a quick look at each series. Any contribution to help keep Sin Bin in top running shape is greatly appreciated.